My Love for millets is growing manifold. I have totally forgot eating rice for lunch now, i cook myself little varagu arisi/kodo millet and have it with my regular sambhar or rasam. 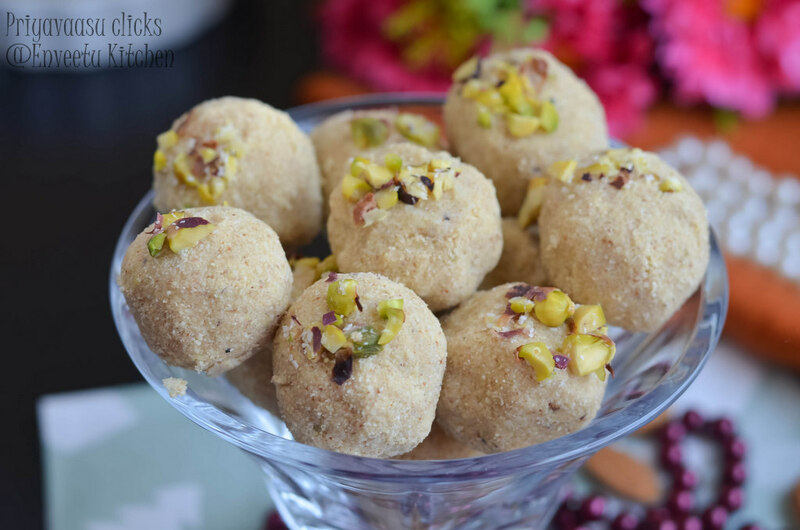 These Thinai Ladoos's/Thinai urundai is an inspiration from the Kerala Special Andi Unda/Cashew-nut balls which i made earlier for the Indian Food Odyssey. These ladoos, have no ghee/butter/any oil. The Fat content comes from almonds and coconut added to it. I have mentioned in my earlier posts that my quest to know more about millets lead me to a journal by NABARD : let's welcome millets back in to our meals. I m giving few excerpts from the article about foxtail millet. Foxtail millet/Navane/தினை is a gluten free grain is and the second most commonly grown species. 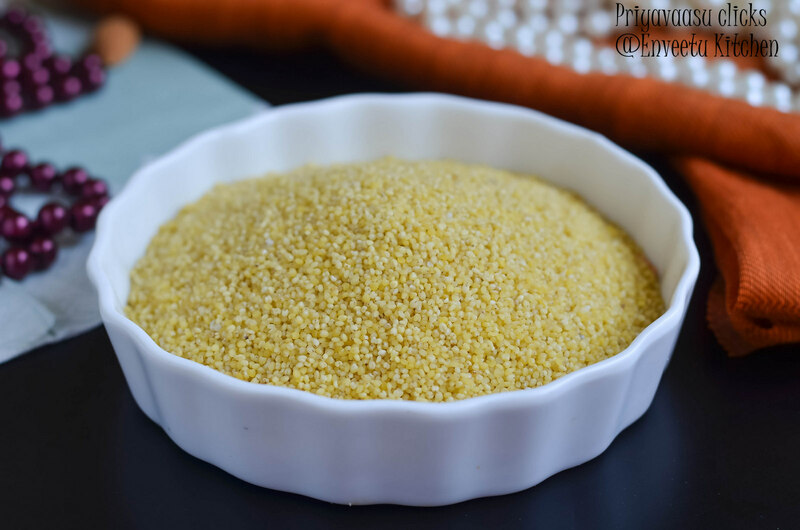 It is one of the oldest cultivated millet. The grains are very similar to paddy rice in grain structure. They contain an outer husk, which needs to be removed in order to be used. There are lots of variety in foxtail millet Kari navane, Kuchu navane, Kempu navane, Jade navane, Hullu navane, Halu navane. Coming to the fats in the ladoos, almonds and coconut, almonds have loads of health benefits apart from being a tasty snack, They reduce heart attack risk, lower ‘bad’ cholesterol, protects artery walls from damage. Almonds help build strong bones and teeth, they provide healthy fats and aid in weight loss. Source here. This doesn't mean that you have to eat one coconut everyday, but try not to avoid it just for the reason that somewhere you read that is high in cholesterol! Check your sources and read good. I personally use one coconut/week. I keep the grated coconut in the freezer and use 1 or 2 tbsp everyday in curries/subzi's. 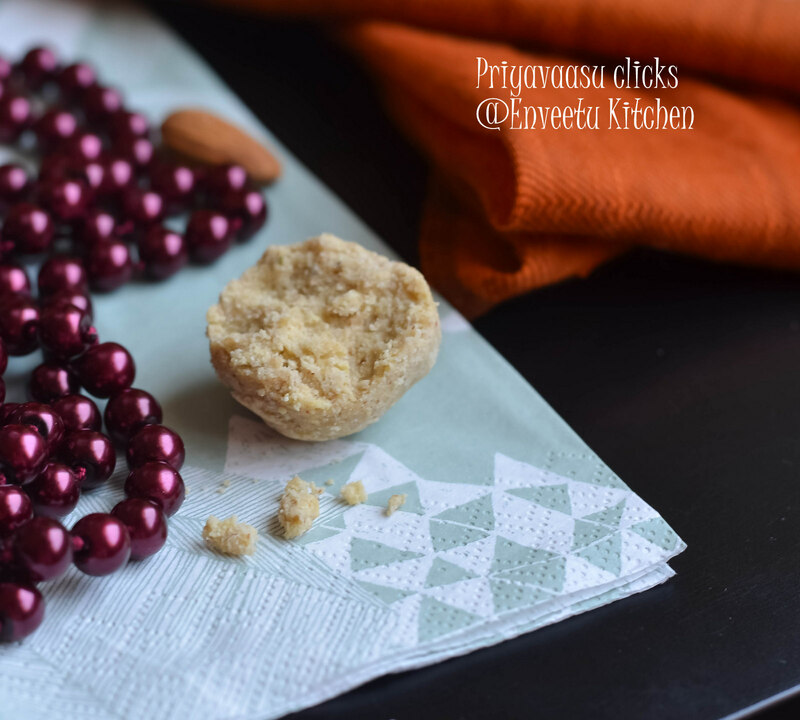 Coming to today's recipe, this measurement makes around laddu's/ladoos. Makes a good evening snack for kids and great gift for festivals. Try it and you will definitely prefer it over your regular ghee-laden sweets. Dry roast each of these ingredients one by one separately. The Thinai/foxtail millet/தினை should be roasted well and it will flower up well. Next dry roast Almonds. Switch off the flame and add the desscated coconut to the hot pan and roast it for a second and remove it from heat immediately. Take care not to burn the coconut. Let the ingredients cool well. First grind the roasted thinai/தினை/foxtail millet to a fine powder. Transfer it to a flat plate. Next pulse the almonds in the mixer, take care not to grind it continuously or else you will end up with almond butter, just pulse it 5-6 times. Now take the powdered thinai/தினை/foxtail millet along with powdered almonds, add jaggery and dessicated coconut and mix well. Now take this mixture in the mixer and pulse it 6-8 times. The mixture will start holding together in the jar itself. Now transfer this to a flat plate and start making balls out of it by pressing a handful of mixture in between your palms. The balls will hold and come together easily. The fat in the almonds and coconut is helping to form the balls. If you want to make it look rich, just dip the top end of the ball in melted ghee and roll it over chopped nuts. I have used chopped pistachios for the decoration. 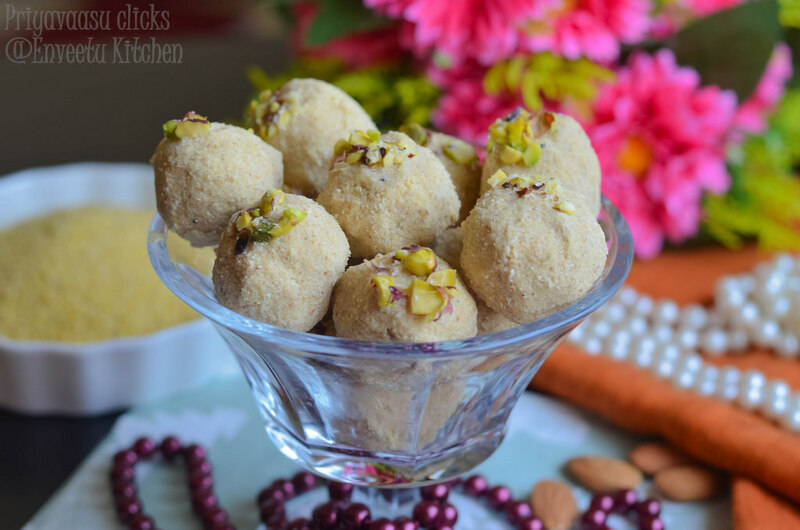 these laddoos look so tempting... can't blv that they are so healthy too!!! dear, is this millet available in regular outlets? 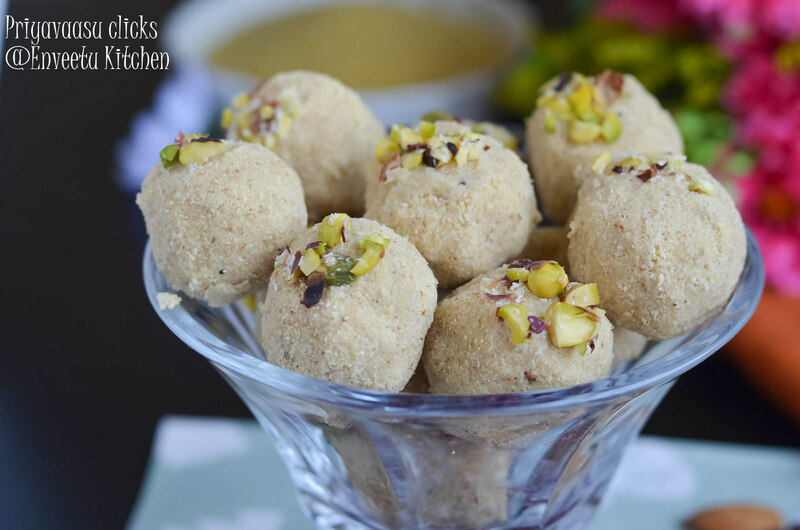 healthy, tasty and tempting ladoos. Would love to try this out.